Figure skating is not an aggressive sport. Skaters compete against each other, but off the ice they are mostly friendly with each other. Rivals might sit together in the dining room and have lunch before they go out trying to better each other on the ice a few hours later. But sometimes their fans think they need to be at war with each other. In the Men’s short program practice at the practice rink at the World Figure Skating Championships in Boston on Wednesday, March 30, Japan’s super star Yuzuru Hanyu and Kazakhstan’s Olympic bronze medalist Denis Ten got close to each other on the ice. This happens sometimes, skaters get too close to each other, maybe not paying enough attention as they are too absorbed in what they are doing. Several eye witnesses confirmed that Yuzuru was skating to his music while Denis was doing a spin. There was enough room around Denis, but Yuzuru almost ran into him. There was no physical contact, nobody was hurt. Apparently Yuzuru got upset and yelled at Denis. Who could seriously believe that one skater tried to hurt another skater? I’ve been covering figure skating for more than 20 years now. I’ve seen many near-collisions in practice and warm up and several actual collisions, but never ever one skater accused another skater of intentionally trying to do anything wrong. Yuzuru probably said this as he was under high stress and had the terrible accident on his mind when he collided with Han Yan in the warm up during Cup of China in 2014. So he kind of overreacted, but some journalists happily used it to create a scandal. As a result, some fans** also overreacted and started sending threats and hate mail to Denis. Authorities in Kazakhstan read the one-sided media reports and were not amused. There were also reasonable voices from journalists and fans, but they somehow were overheard in the cacophony of the outraged. Someone even went as far as posting a video from another warm up or practice session where Denis and Yuzuru came close to each other and used this as “proof”. Get a life. You can see many, many such situations between many different skaters. Interesting enough, the video of the practice session in Boston was not shown, although Fuji TV was there and taped the session. There should be footage from the incident, but they don’t release it. Unfortunately, the Japanese Skating Federation apparently did not realize how the whole situation developed and did not intervene right away. Only on Saturday team leader Yoshiko Kobayashi told the press that the Federation doesn’t file any kind of protest and never intended to do so. The Japanese Skating Federation also confirmed this in a letter to the Kazakhstan authorities. 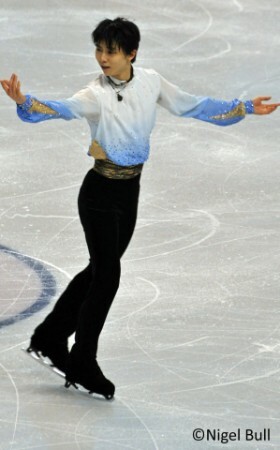 In the end, only both skaters suffered from the whole story***, because Yuzuru received also some criticism. Yuzuru approached Denis on Saturday, they talked to each other, they shook hands. They closed this chapter, but unfortunately some people (who think they are fans) still didn’t let go. Even when Denis published a photo of him and Yuzuru shaking hands, they wouldn’t stop arguing. And, by the way, in the free skating practice at the main rink on Friday, Yuzuru, who was skating to his music, got really close to Shoma Uno, who was doing a spin. Shoma just was able to get out of the way in the last second. Would anyone seriously believe that Shoma was intentionally in Yuzuru’s way? There was a lot of feedback to this article, both negative and positive. There are some people you can discuss with and some you can’t as everyone has their own truth sometimes. Therefore I decided not to react to Twitter comments. This matter should be put to rest. However, I thought over everything again and I edited the article in four places and marked them by stars. *My main criticism towards Yuzuru Hanyu was that he accused Denis Ten of being intentionally in his way or even “trying to hurt him”. This criticism was based on an article that quoted Yuzuru in that way. However, I did not make it clear that I relied on a quote in an article. The quote in the article might have been distorted or wrong as some people say. I cannot prove one or the other as I have no voice recording from the mixed zone. **I took out “Yuzuru’s fans” as some of his honest fans felt offended as they never would send hate mail or nasty comments. I do not want to blame all of his fans. There are just some nasty people out there that hide in the anonymity of the internet, they are not necessarily Yuzuru’s fans. ***I changed “careless words in the mixed zone” to “incident”. **** I added another paragraph to make my point clear. I realize that many people read this article who don’t know English so well and they might not completely understand all nuances. This article is not directed against Yuzuru Hanyu or any other skater and it is not about who was doing what in the practice session. The main point of this article is to illustrate what can happen when comments are blown out of proportion and to criticize those people that continue to fight even after the issue has been settled by the skaters.